The right to speak freely is a right often confounded with other, more nebulous, unenumerated rights. Many, particularly online, conflate the right to speak with the right to be heard and the right to a platform. But it gets more vicious than even that particular level of entitlement. Imagine, if you will, someone pinning you against a wall and screaming in your face, pushing their weight against you to prevent you from leaving. Only when they’re satisfied will your violent interlocutor release you, at a time and manner of their choosing. Is this what free speech looks like? To some petulant internet users the answer appears to be yes. Over the last several months the reactionary, anti-feminist GamerGate movement has been pared down to its most extreme elements, still capable of organising harassment against the movement’s pet targets in spite of their vastly reduced numbers. GamerGate is now reduced to an almost pitiable recycling of their “greatest hits,” periodically resurrecting old targets and memes when they need inspiration to carry on for yet another tedious day. The latest track on GamerGate’s golden oldies collection is the Good Game Autoblocker, or ggautoblocker, a tool developed by programmer Randi Harper that automatically blocks the vast majority of GamerGate’s Twitter activists. The tool was loathed by GamerGate from the moment it was publicly released and their rage found a new crescendo when the International Game Developers Association included it in a list of resources to combat online harassment (it is also worth mentioning that IGDA executive director Kate Edwards has been a frequent target of GamerGate as it leaves no prominent woman in the industry untrolled). Bear in mind that what the ggautoblocker does, in practise, is prevent GamerGate tweets from showing up in ones mentions; it simply makes it harder for GamerGaters to use Twitter to contact you as an individual but otherwise inflicts no harm on anyone. It’s victimless. But there is renewed rage about the autoblocker because, inspired by game developer Mark Kern, a newfound supporter of the movement, GamerGate wants to try to actually ban the tool and sue Randi Harper for “defamation.” In what universe does this make sense? Apparently some GamerGaters feel slighted by the supposed implication that every person blocked by the script is a misogynist harasser. A particularly amusing thread on the GamerGate Reddit hub, Kotaku In Action, shows one user proposing to use nothing less than the Americans With Disabilities Act of 1990 to take down ggautoblocker. 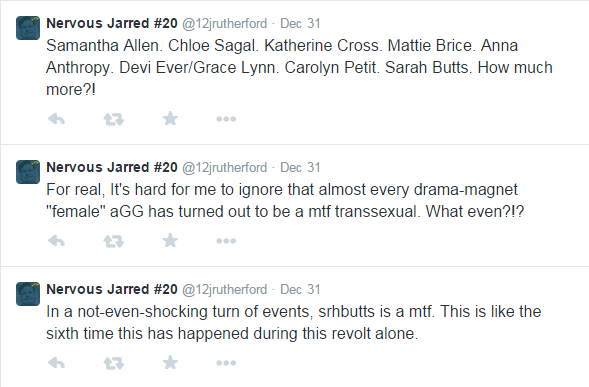 The rest of their post is dedicated to using what amounts to spammers’ tactics to circumvent peoples’ Twitter blocks. An example of attempted block evasion. Also, no, that doesn’t actually work. It should almost go without saying that during this pathetic farrago the banner of free speech has been waved until its edges frayed. What offends GamerGaters about the autoblocker, aside from the fact that a woman found a technical solution to a social problem, is that it denies them the ability to impose themselves on targets. The idea that the women, people of colour, and queer folk who’ve comprised the majority of GG’s targets might be able to curate their online spaces and have certain discussions only with those of their choosing is repugnant to many GamerGaters. In the absence of genuine legal recourse, the worst thing you can do to a bully, harasser, or troll is ignore them after all. Further, individual GGers are offended at the suggestion that they should be “lumped together” with the toxic elements of their movement. They’re polite and just want to debate, after all; they are the Socratic interlocutors, while nebulous others are the real harassers. How dare Randi Harper and her autoblocker conflate the two! But the reality, for those of us who have been living with this for the last several months is as follows. GamerGate has offered nothing new under the sun ideologically. The “argument,” devoid of meaningful content as it is, was had in September and October of 2014. GamerGate was heard and most people decided they were not buying what GG was selling. The implication that some great ideological reckoning is yet to occur is absolute nonsense. Journalistic ethics, the ethics of crowdfunding, political content in game reviews, the nature of the gaming community, and so on are discussions that are ongoing and happening quite productively in a number of spaces. Blocking GamerGate is not about silencing contributions to that discourse as much as it is about blocking toxicity. Comic by David Malki of http://wondermark.com/, the work of art that gave us a perfect new phrase. “Polite” GGers, defined as those who do not explicitly swear or use slurs, nevertheless harry the people they target because they do not take no for an answer and come in packs. 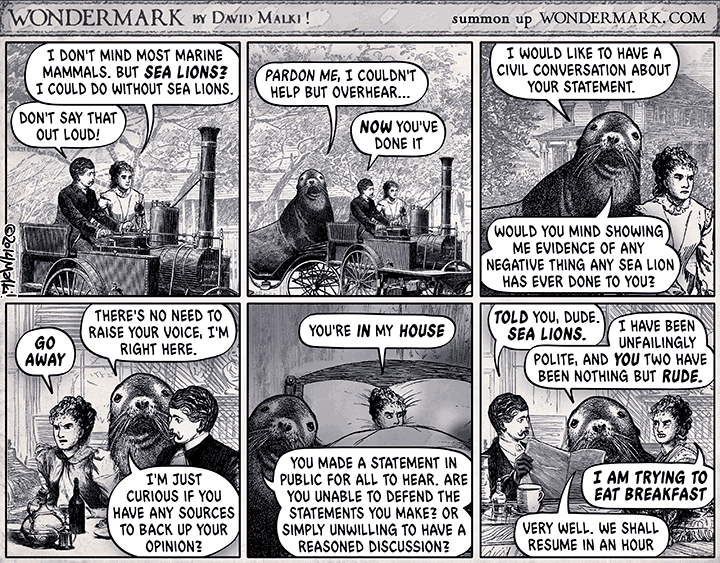 The phenomenon of “sealioning”– barraging a target with politely worded but interrogating questions asked in bad faith– gained a name under GamerGate because of how common the tactic was. The proof is in the pudding. Everyone who has activated ggautoblocker, myself included, has seen a marked improvement in the nature of our Twitter mentions. It has made gaming Twitter a somewhat safer, more manageable space for the women and minorities GG has made it their business to attack. For months I resisted using the ggautoblocker because I was leery of handing over judgement and control over who I blocked to a pre-existing list so long that I could not conceivably check every single account. I wanted to do exactly as GamerGate wished– judge each person I interacted with as an individual and block or not block as needed. Never mind the fact that I was attacked many times over by individual GGers who felt my block was unfair, thus driving more aggression my way from their friends. Hilariously, many GamerGaters assumed I was using ggautoblocker when I really had only just blocked a handful of people manually. I finally relented after GamerGate dug up my deadname and began using it against me on Twitter. The blanked out name at the bottom is my old name. Originally posted on a thread about me on 8chan, GamerGaters took to using it on Twitter. Enough was enough, and surely it was my right to decide that. Also, who wants to see this in their mentions all day? This is Ralph, leading muckracker of the GamerGate movement whose website Ralph Retort has begun to specialise in outing trans women. Other great hits of his include posting disturbingly detailed pictures of Brianna Wu’s home on his site. The Randi referred to here is Randi Harper. 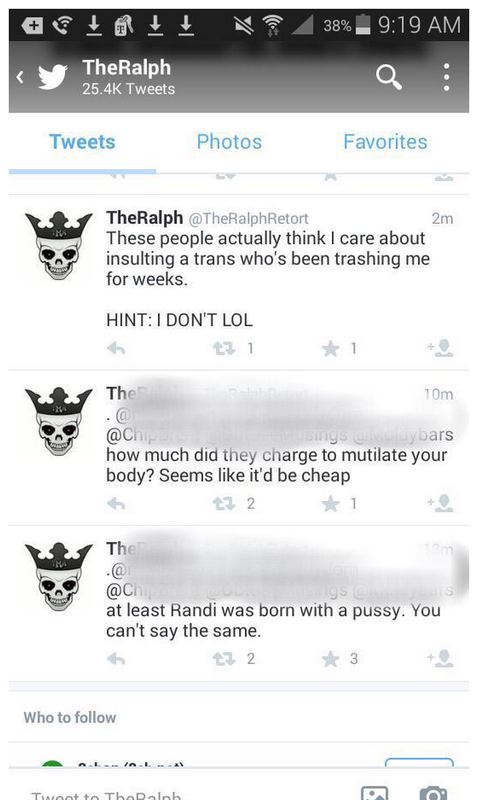 This gentleman is a writer from the staunchly pro-GG gaming site Tech Raptor. To GamerGate, doxing a trans woman and weaponsing their birth names is “free speech.” This also serves as a useful example of the “polite” disingenuous apologism I mentioned earlier. GamerGate explains their dogpiling and aggression by arguing that their targets, myself included, are “public figures” who should expect feedback. While this repeats GamerGate’s favourite rhetorical slippage of conflating harassment with something noble, even on its face it’s more than a little strange because it’s precisely through being attacked by GamerGate that their targets became public figures in the first place. Their own obsessive scrutiny becomes moral justification for more of the same. Could anyone be blamed for using an admittedly blunt instrument to try and break that terrible cycle? Do we not have the right to choose who we talk to? Portraying this jury-rigged, last ditch attempt at victimless self defence as some grand assault on freedom of expression feels perverse considering that the GamerGate movement has, itself, striven to silence and drive out critical voices again and again. Often violently. More than a few women online have pointed out that GamerGate’s mentality on this issue is similar to men who street harass, who catcall a woman and are then incensed when she ignores him, sometimes going as far as following the woman, touching her, or attacking her long after she made clear she wasn’t interested. GamerGate seems to be perfecting the digital version of this terrifying harassment. Indeed, it often seems they wish to pin us down and shout at us until they’re satisfied. But this has been going on for nearly seven months. Who knows when that’ll be?